Wow – so very sophisticated What a contrast – soothing turquoise and energizing red.. Love Tobi Fairley's..
All of these are lovely, I'll have to remember those kitchens for future reference. An unexpected combo but love how several of these look! My faves are when the turquoise is a calm backdrop and the red adds a pop of color and energy! Wow, I love the first two kitchens but then I've always had a thing for 40s/50s appliances and fixtures. Nice post! OMG, I LOVE turquoise and red! What a great post with wonderful photos. I think I'm going to have to Tweet about it now!! I really like this color combination, too. It's unique but definitely fun. :) The rooms from Domino are my favorites! One of my favorite combinations! I've had Jennifer Flander's bedroom on my wish list for a long time! I also LOVE Jane Costlick's cottages! Great Post! Just dreaming away here! Love each and everyone of these! Erin, I sent you an email asking for your design advice for my post today: Primed and Ready! Welcome your input and hope you're feeling better. It is a great color scheme. That dining room chandelier is fab. Love this color combo! I find red to be less harsh with turquoise than with black or when it stands alone. If you are trying to bring in the red trend, this is the way to go. It really takes on a softer side. Beautiful post, thanks Erin! One of my favorite combo's and actually one that I wanted to discuss with a client I'm meeting with next week! Thanks for all the amazing pictures! Sorry for the lack of comments last couple of weeks. Have had major laptop issues, which made internet access a bit difficult! It's all just too good! I love the bedroom in the first picture, and every single kitchen pictured. Seriously, I love every one of them enough to have as my own kitchen. 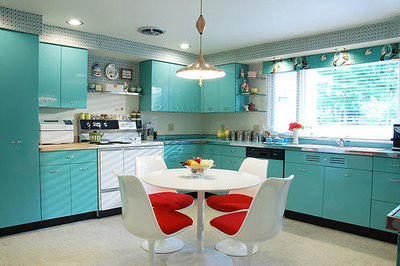 Of course Pam's turquoise kitchen from Retro-renovation is unbelievable. She did such a fantastic job on that renovation! Hi Erin! I just browsed through your entire blog…j'adore! 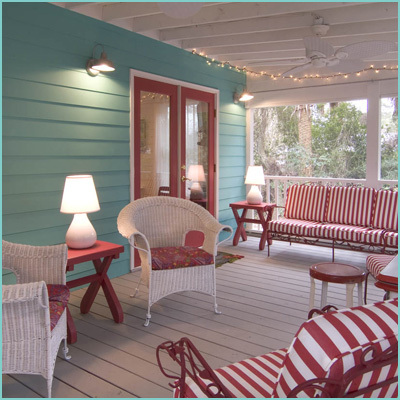 Just like you, I luv the color turquoise so I painted my house Tiffany Blue. Someday, when you have time, come and visit me. Great collection of images! !1 Just adore that great white sink!! I love the turquoise and red–especially the very first photo. Meh. Guess I'm in the minority this time. I think the red overwhelms and detracts from the subtle soft turquoise. Erin, while your at turqouise/red/white rooms, check out my latest post, my family room is just that. Not as stylish, but good for our wild family life! What great colors together. Those are wonderful to look at. Thank you for sharing. Great inspiration. wow! i was jUST telling my husband I have decided to paint the red legs on our farm table white….because "they didn't match alll the turquoise". hmmm….maybe i REALLY need to rethink this! i think red does for turquoise what salt does for chocolate chip cookies! I love chocolate and don't know why salt makes the dough so good, (of course, it makes the sweet even sweeter,) and I love turquoise but didn't realize how much red does for it until seeing it on your blog! Hi I just found your blog and love it! I love turquoise too! absolutely love this color combo! The red & white chandelier reminds me of candyland – so fun! I LOVE this color combo! So fun!! this is quite possibly one of my favorite color combo's EVER! great choices. Thanks to your wonderful pics turquoise was chosen for our laundry room. And there are lots of white cabinets, gray stone floor, ferns plus red enamelware sprinkled around. Very cheery for doing the work. This is one of my favorite combos, too! Thanks for so many great images. Thank you for showing me the beauty of Turquoise. I've never liked it and it may have even been one of my least favorite colors. But your place looks really nice! Wow! I didn't realize how pretty that combo can be! I love that you find so many great photos! Thanks for sharing! 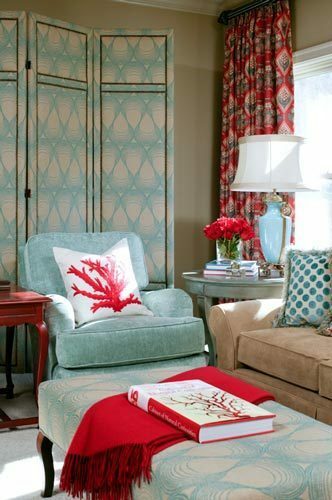 I lve the splashes of red with the turquoise! It makes the room more vibrant! This seems like such an unusual color combination – but I totally LOVE it!!! This is quickly turning into one of my favorite color combos. I'm also really into light green — sort of granny smith apple green but more muted with dark red. it's that pop of red that gets you! I guess I had never realized it, but red and turquoise are a favorite combo of mine too! Wow!! 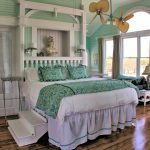 Turquoise is such a HAPPY and bright color- and I love how you brighten up each room with it! Great work! I just love red for interior decoration…. color combination are cool… red with other light colors like white, light blue. always opened to something new. I love turquoise and red. This is my perfect house. I want this kitchen. good decoration Erin,.. Ty for share,. Never thought of turq and red love it! You may love the 1957 mosiac mermaid that reigns over my blog. I just stumbledupon you, I LOVE turquoise as well and just fell in love with this color combo yesterday, what is the chances, I would find this blog haha. I make hats and want to made a red and aquamarine hat, was going to do that today! Also you might want to delete the ad by disa. It has nothing to do with your blog. Actually, worse than that. Such eye candy! my two favorite colors are turquoise and red! enjoyed looking at it! This color combination looks really great, If done the right way like you feature here. Not everybody are brave enough to have a color like this. A hot colour , more simple tourquoise = a beautiful home. Turquoise/teal and red are my favorite colors to combine. I've done it in my apartment and also with my wardrobe. Thanks for even more inspiration! Great pictures. Turquoise has always been one of my favorite colors. I also LOVE bold paint. The colors are used very beautifully in a very stylish way. Its all pix is so wonderful and attractive. Colours are used great and wonderful. I like this colour combination so much. Yes, loving this look! Great pics!! Thanks for those lovely photos! I just added the link to your blog from mine, it's just so lovely! 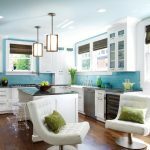 What color turqouise did you use in the kitchen?